A few years back I was in a terrible car accident. The kind of accident where the doctors tell your family “If she makes it through the night…” Thankfully, I made it through the night and if you met me today the only signs of my accident are the abundance of scars on my arms (one that my niece referred to as a bug cause, well, it looks just like a squashed bug). But one thing my accident did do, it reminded me of how much I love old-fashion malted milk. Spending a couple weeks in the hospital is never fun, and oh so boring. And the hospital food is less than awesome. But we discovered the cafeteria at the hospital was quite delicious. Lucky for me, the lunch service kept forgetting my lunch. Seriously, almost every day we watched as they delivered lunch to all the rooms around me, then when the nurse came in to check on me we would inform them that I did not receive my lunch. They would offer to send down for a lunch tray or give my husband a voucher to get me food at the cafeteria. I always chose the cafeteria! My favorite things to get with those blessed cafeteria vouchers were a chimichanga and a chocolate malt! Not the healthiest options, but hey, I almost died so I wasn’t counting calories. I ate many chocolate malts during my hospitalization and it reminded me of how much I loved old-fashion malted milk. So much so, that I always have a can of powdered malted milk in my pantry for the (more) occasional chocolate malt or to add to things like pancakes and cookies. So when I was making a batch of regular peanut butter cookies, I opened my pantry for some ingredients and the malted milk powder caught my eye. Peanut butter and malt… why not? And because I absolutely love oats in my cookies I thought I’d throw them in too. 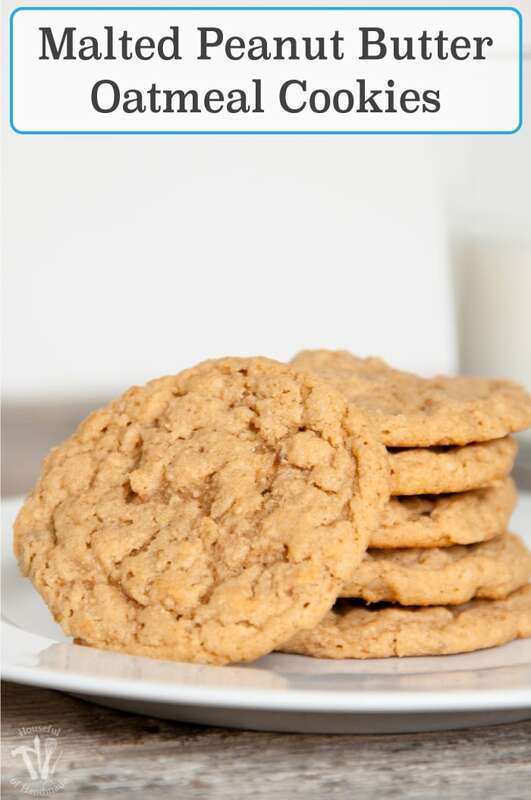 The result: a malty, nutty, slightly crunchy but with a chewy center, peanut butter oatmeal cookie. YUM! While most of the ingredients in these cookies are pantry staples, you might have to go grab a jar of malted milk powder. You can usually find it in the grocery store next to the chocolate milk powder (I bought mine at Super Target, no specialty store needed). And after you use it in these amazing cookies, you can start adding it to all kinds of goodies (throw about 1/4 cup in your pancake or waffle batter next time, I promise you’ll thank me for it). 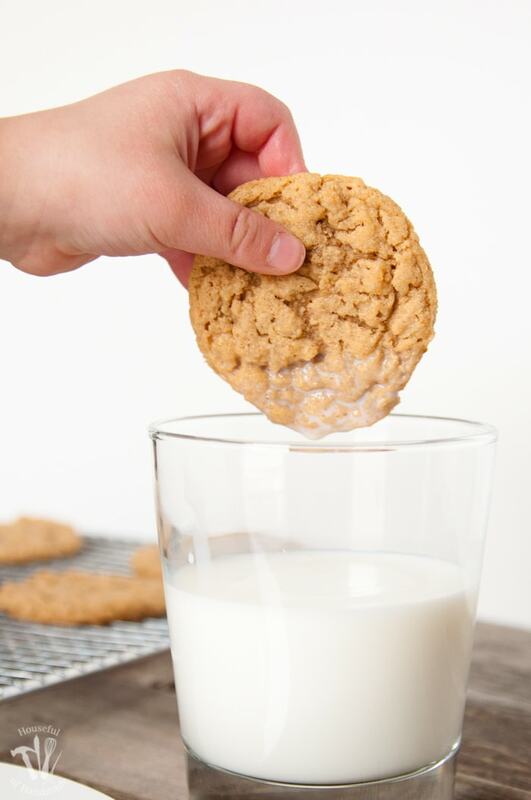 Cookie heaven is these Malted Peanut Butter Oatmeal Cookies dipped in a cold glass of milk. Yum! 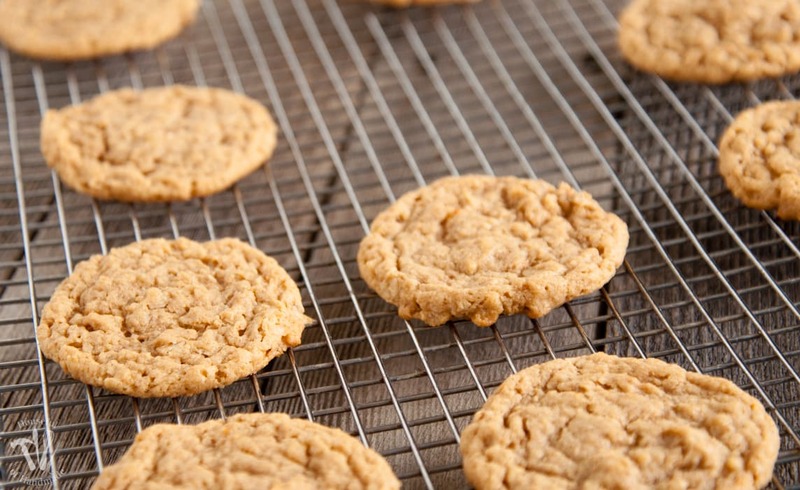 These Malted Peanut Butter Oatmeal Cookies are amazing! 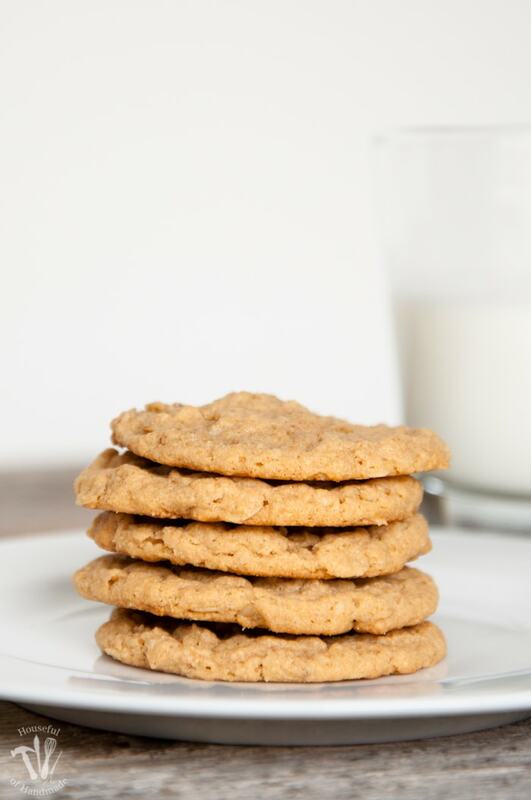 They are made with whole wheat flour, peanut butter, oats, and malted milk to make them really special. The result is a cookies that is malty, nutty, slightly crunchy but with a chewy center full of peanut buttery goodness. In a stand mixer, cream together butter, peanut butter, and brown sugar until lightened in color. Scrape sides well. Add in egg and vanilla extract and combine well. Scrape sides well and add in flour, oats, malted milk, baking soda, and salt. Mix well, but do not beat. Drop 1 Tbsp balls of cookie dough onto parchment paper lined baking sheet, spaced about 2 inches apart. Cook for 8-10 minutes. Allow to cool for a couple minutes on baking sheet before moving cookies to cooling rack to finish cooling. 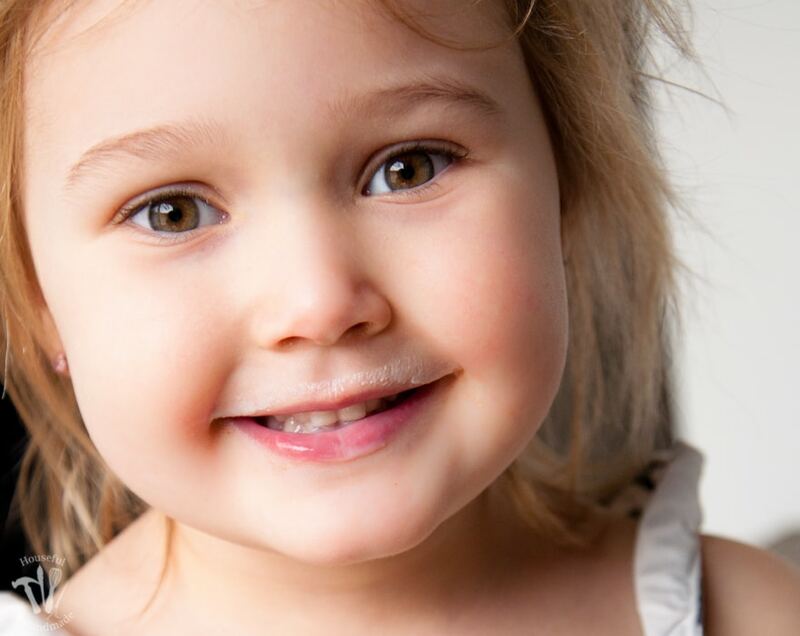 Awww, what a beautiful picture of your cookie helper! (Seriously, if you don’t do photography portraits, you should!) And these cookies look fantastic, nice crinkles! I love malted milk and candy too! My kids not so much, but that just leaves more for me 🙂 I’ll have to definitely try this recipe. I wish my kids didn’t cause they devoured these cookies! I hope you try them, they are delicious. These sound SO good! I have been craving oatmeal cookies all the time lately. I made a batch last week but now I want to try yours! My grandma used to make milk shakes with malted milk powder and they were so good. It would be so yummy in cookie form! 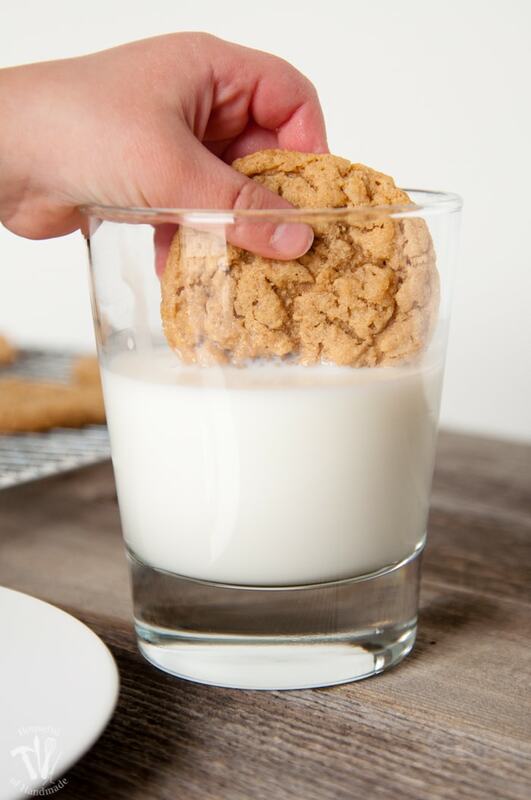 Oatmeal cookie cravings sound good to me. You would have been happy at our house last week cause I made these 3 times! I hope you enjoy them. Yes, yes, and yes!! Oh my yum! 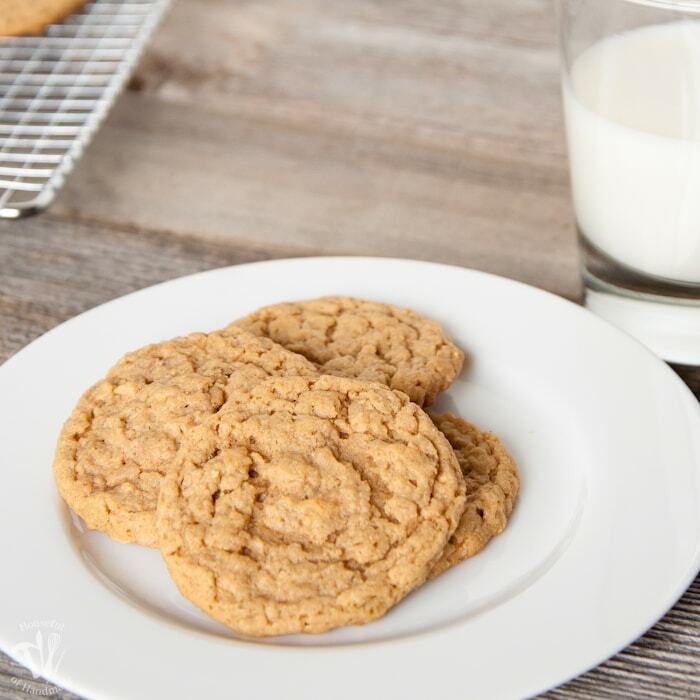 I love peanut butter cookies, oatmeal cookies, and malt, so this is a match made in heaven, I am sure! Thanks for linking up with us at The Wednesday Showcase!